"Using modern detecting techniques, a private investigator picks up where historians left off, tackling the myths and legends about the misadventures and the eventual killing of the notorious outlaw, Billy the Kid. One by one, these myths and legends are scrutinized by examining the circumstances surrounding his life, death, and crimes from both contemporary sources and the physical evidence still extant today, viewing all through the lends of a legal investigation to determines the veracity of historical claims." 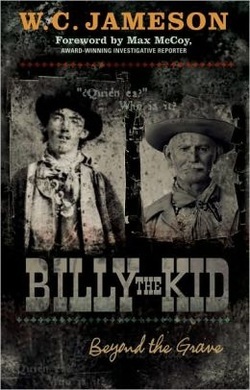 ​Billy the Kid: Investigating History's Mysteries has attracted the attention of several documentary producers and is a sequel to the best-selling Billy the Kid: Betond the Grave. (See right). For a complete list of the books in W. C. Jameson Buried Treasures of America Series, click on the Treasure Hunting section of this website. Another of Jameson’s most popular books is Billy the Kid: Beyond the Grave, a regional best-seller. 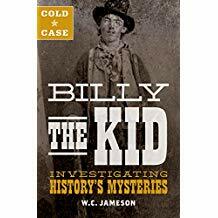 This controversial book presents stunning evidence that the famous outlaw, Billy the Kid, was not killed by Sheriff Pat Garrett in 1881 but went on to live an amazing life for the next sixty-nine years. "But to another set of folks, trains represented easy money. 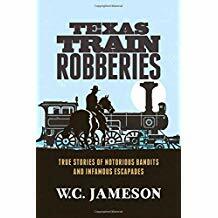 Some infamous personalities who made Texas railroads their targets include Black Jack Ketchum, Sam Bass, and Rube and Jim Burrow and their gang. Although most train robberies were successful, many oulaws miscalculated the power of their dynamite - or passengers - often leading to unforseen results. Jump aboard and hang on for some of the wildest train rides ever taken in the Lone Star State."